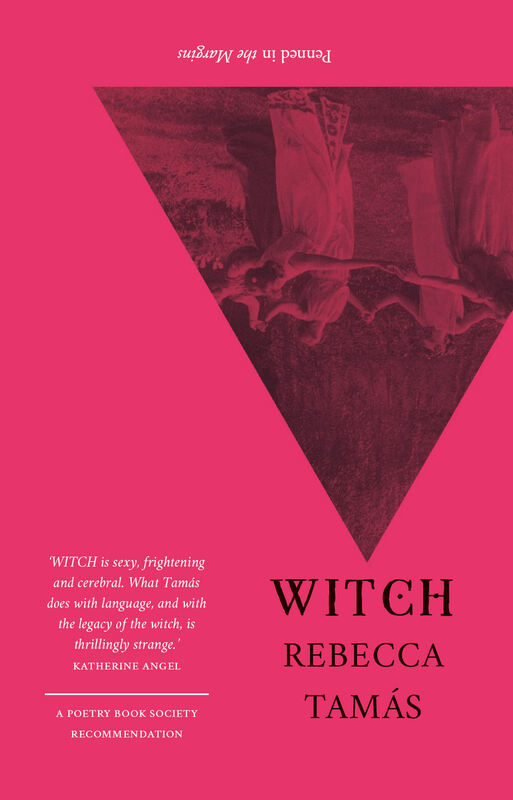 "Full of things to divert, entertain and provoke"
Discover a multitude of new and unusual poetic forms – from tweet to time-splice, and from skinny villanelle to breakbeat sonnet – in this inspiring and inventive anthology. Adventures in Form features over ninety poems by forty-six contributors including Patience Agbabi, Christian Bök, Joe Dunthorne, Inua Ellams, Roddy Lumsden, Ian McMillan, Paul Muldoon, Ruth Padel and Hannah Silva. 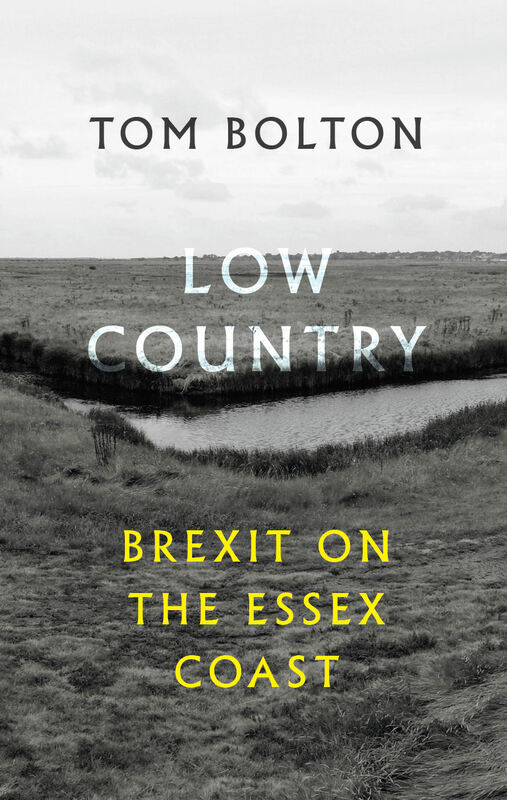 Edited and introduced by Tom Chivers. Patience Agbabi, Simon Barraclough, Christian Bök, Colette Bryce, Theodoros Chiotis, Tom Chivers, Emily Critchley, Rishi Dastidar, Joe Dunthorne, Michael Egan, Inua Ellams, SJ Fowler, Giles Goodland, Kirsten Irving, Nathan Jones, Valerie Laws, Ira Lightman, Toby Litt, Roddy Lumsden, Sophie Mayer, Chris McCabe, Ian McMillan, Richard Moorhead, Paul Muldoon, Ruth Padel, Nathan Penlington, Andrew Philip, Richard Price, Sam Riviere, Hannah Silva, Iain Sinclair, Steve Spence, Paul Stephenson, Jon Stone, Ross Sutherland, George Szirtes, Chris Thorpe, Claire Trévien, George Ttoouli, Tim Turnbull, Jack Underwood, Hannah Jane Walker, Tim Wells, James Wilkes, Chrissy Williams, Tamar Yoseloff. Full of things to divert, entertain and provoke. Adventures in Form teems with life. It is the start of a new, healthier and more joyous way of looking at the poetic endeavour we live among. It's essential reading right now. The constraints we chafe against in the creation of 'txt msg poMs' may be unravelling, but the anthology's long-term legacy will be its sense of gusto. Look at this as a pattern book of the possible; it enthuses, and that enthusiasm becomes contagious. 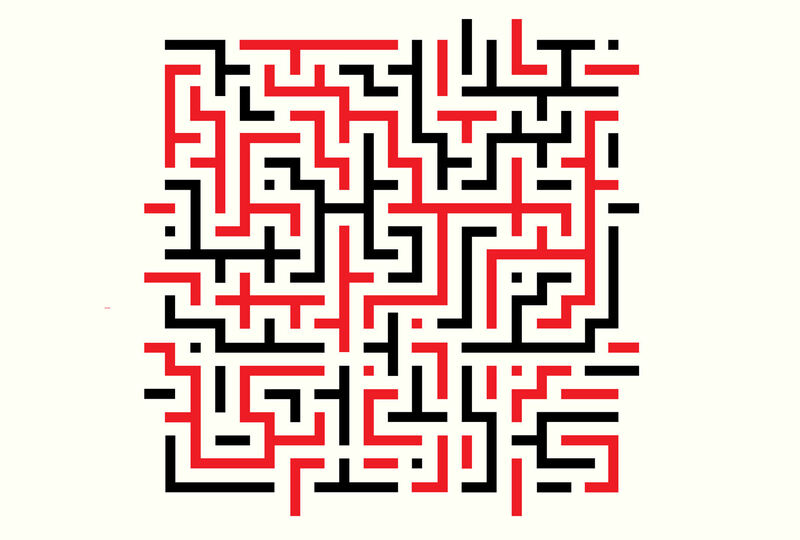 Tom Chivers has put together a "compendium" of poems in unusual forms: found poems, text poems, anagram poems, a poem composed of song titles, another of numbers. 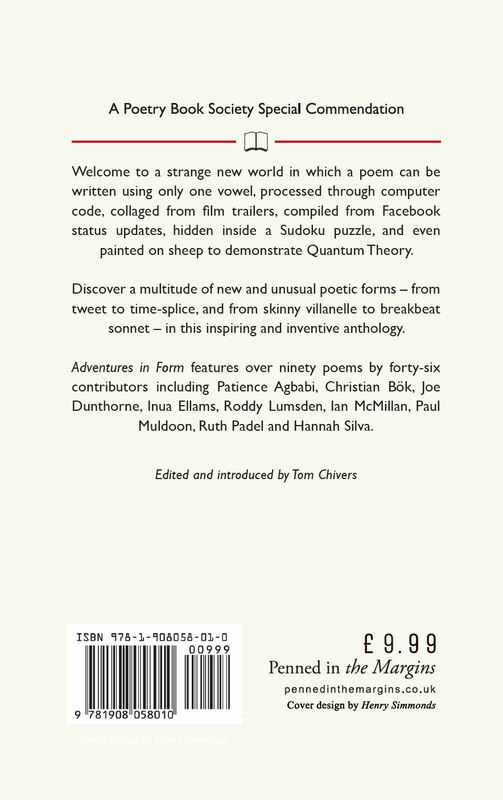 A fetching example is Paul Stephenson's "Notes on Contributors", which assembles biographical notes from the back of poetry magazines, but with the content omitted. [...] We liked Valerie Laws's haik-ewes, in which a word was written on the back of each of fourteen live sheep, who thus wrote haik-ewes as they moved. Ms Laws computes that 87 billion haik-ewes are possible. 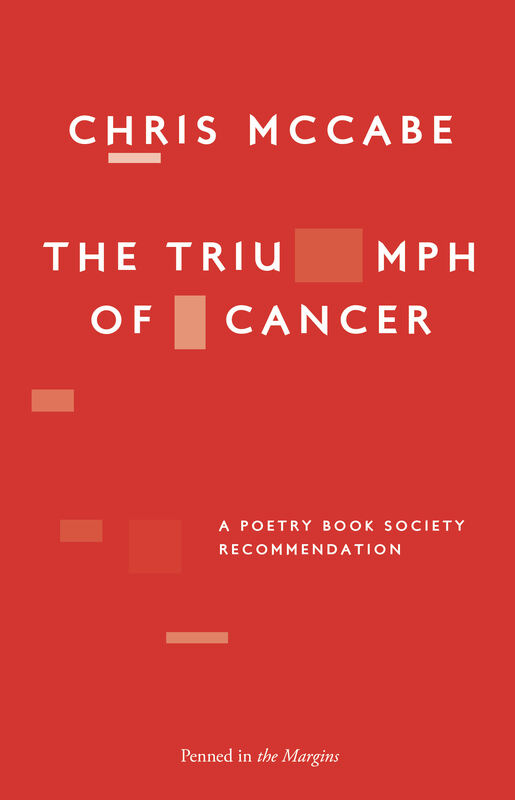 [...] The most ingenious poem in the book is Nathan Penlington's "annotated silence", consisting of four symbols and their corresponding footnotes. 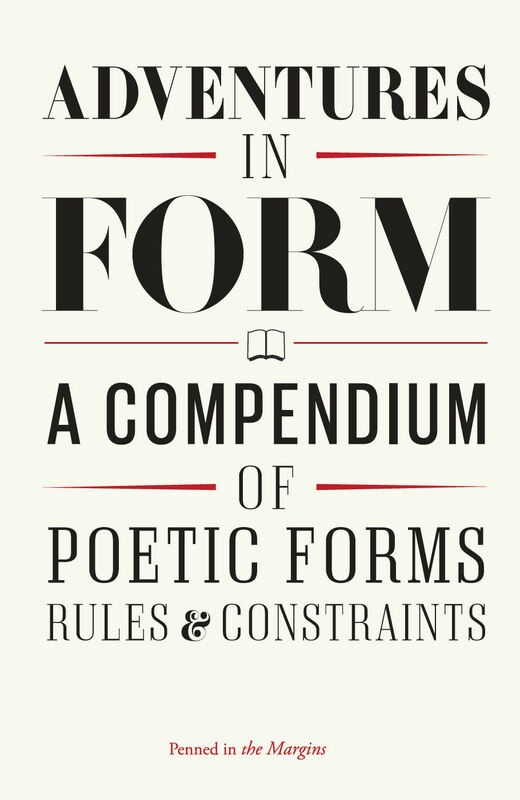 Adventures in Form is arguably more transformative an anthology than American Hybrid in that it shows the ways in which poets are rearranging the cogs and gears of poetic structure. So often the poems in Adventures in Form reward rereading because they engage that dynamic Creeley identified: form as an extension of content, each in conversation with the other, even if only because they are trying to convert and divert one another ... [W]e need poetry, especially a poetry like that of Adventures in Form, which neither surrenders language to the other media surrounding us, nor surrenders itself wholly to the rules of such media. 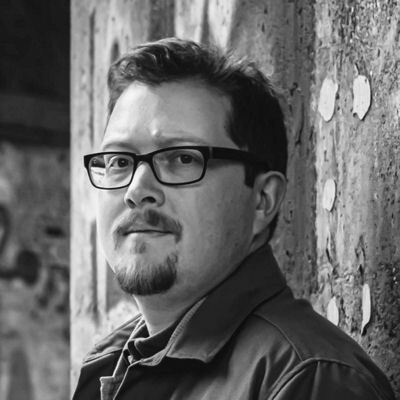 The adventure’s an intervention, and on the other side of the encounter, you’re headed in an alternative direction, part of a different movement altogether. 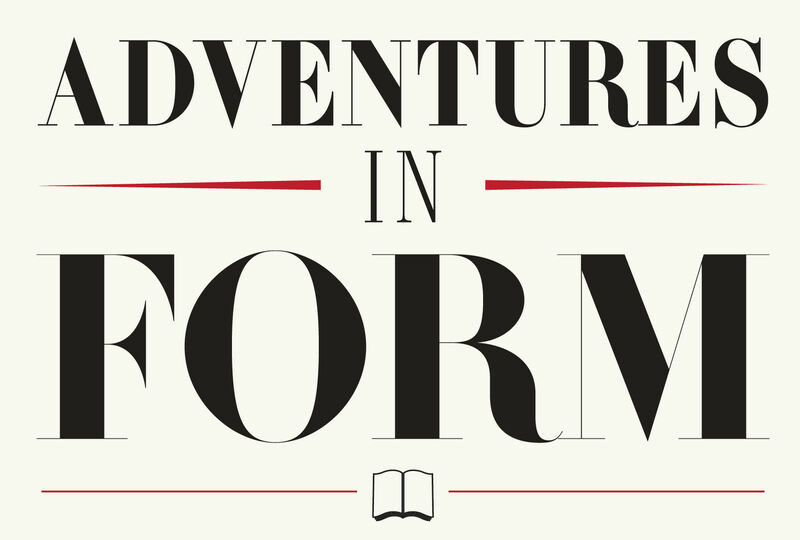 [Adventures in Form] is a gem, gorgeous as always from Penned in the Margins, and ambitious. It’s stuffed full of sweets. The book is a joy. It’s full of discoveries. It marks a new era where poets of different kinds can work together on an acknowledged shared project, instead of dicing up the whole project of poetry into tiny bits. Adventures in Form ... is an exploration of the ways in which form makes poetry sing. Adventures in Form is a wonderful book. Like a literary equivalent of a pinterest board, it makes you want to have a go at creating your own versions of the poem as much as to stare and coo over them. 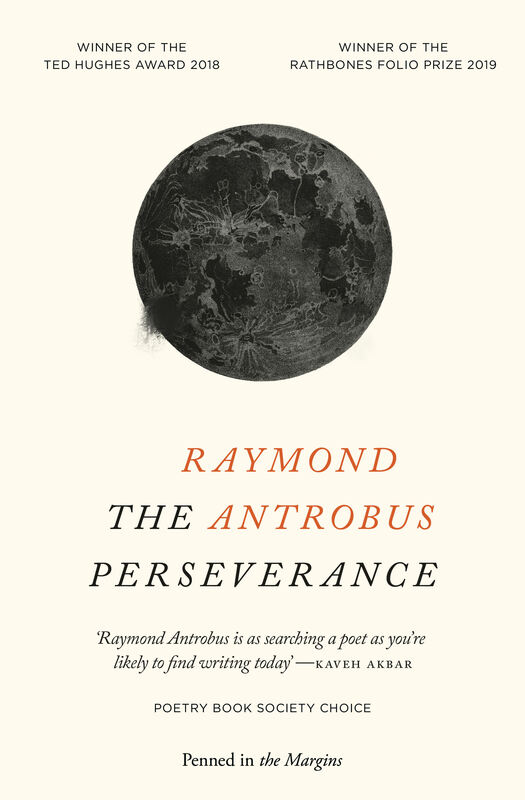 I would urge anyone writing poetry, or anything else, to read this – it is choc full of feats of poetic-form wonderment – experimental, refreshing, inspiring and thought-provoking. Get it while it’s hot!